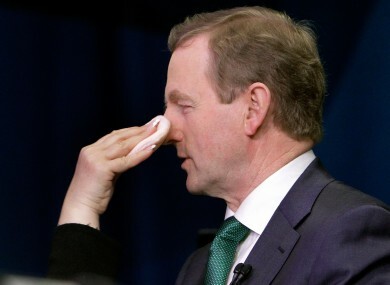 Enda’s attempt to improve his image – too little, too late? If you can afford it, please consider supporting the Simon Community this Christmas. Like most Irish people, I enjoy complaining about the Late Late Show almost as much as I secretly enjoy watching it. As the world’s longest-running talkshow and for a long time (along with Liveline) Ireland’s only forum for public debate it, much is demanded of it. Last night it delivered, a triumph for public-service broadcasting but an appalling indictment of our politics. In time, the breezy throw-away slot of a selection of puppets singing a charity version of “We All Stand Together” will drip with bitter irony for media and political historians. An irreverent puppet-turkey, judged by many analysts to to be be more qualified to run the country than the current incumbent, blithely told us that Childline needed our money to stay open and provide an essential service to those failed and abandoned in our country – our children. Almost a hundred years in, and we still cannot manage to carry out even the most basic functions of a democratic state without having to go on national TV and beg. That section was wedged in somewhere between Brendan O’Carroll and Mrs. Brown and the discussion on homelessness before Olly Murs played his new single. It was a perfect example of the peculiar brilliance of the Late Late show – it effortlessly combines utter banality with topics of the utmost seriousness. The discussion on homelessness began with Christy Burke, Dublin’s lord mayor, recounting how he and the Irish prime minister had walked the streets of Dublin late at night to see for themselves what the situation was like. Much was made about how shocked the Irish premier was by the needles, the conditions, the sheer scale of the problem, and yet no-one asked why. After all, he put many of them there. 39 years have passed since Enda Kenny first entered Leinster House, through a gate just around the corner from where Jonathan Corrie died this week, and until this week, Enda Kenny – father of the Dáil and leader of the nation – had never noticed the problem of homelessness in the city. And in a country governed by spin, where a recent opinion poll shows that every established party is on its knees with the electorate, it is hard not to be cynical about why it is at this very moment – a few weeks before Christmas, with his party’s popularity in the doldrums – he is finally venturing on to the streets. You may think that harsh, until you think about what he spent the rest of the week doing – gadding about with the gays in Pantibar, desperately trying to win back a few votes that his unthinking, unquestioning Christian fundamentalist party now need more than ever. Next week, Kenny faces the prospect of losing control of the country entirely as anti-water charge protestors take to the streets on December 10, angered over another tax used to fund an already criminal waste of taxpayers’ money. What has this got to do with homelessness and Childline? The €500 million spent on setting up Irish Water could have been used for better things – for instance, it could have housed Dublin’s approximately 170 rough sleepers in the Shelbourne hotel. It would be enough to fund the Simon Community to provide a bed, food and a Christmas gift to homeless people. It could have been used to fund essential services for children – the innocent and ignored victims of many addictions – and for those who look after them that struggle day to day. But no. Enda will limp along, together with the rest of his colleagues so shocked and disturbed at the all-too-regular occurrence of a man dying on the street, and busy himself doing nothing of substance while trying not to lose face over Irish Water. In doing so he will spend more millions – many of them going to dubious businesses people previously caught with their hands in the national cooke jars – on meters that won’t be used and spin doctors to explain why. But to make a real change in Irish politics in the little time he has left, it would require a change of heart that would put Saint Paul’s fall on the road to Damascus in the ha’penny place. It would require the abandonment of the cronyism and culture of backhanders and back-scratching that has served Enda, the professional political class and their masters so well. It would require the realisation that society’s first priority should be to protect its weakest members. It would require Enda Kenny to realise that his entire political career to this point has been an inauspicious waste of time, and for him to set about righting 39 years of wrongful indifference to those who have funded his largesse. For this government, it’s too late. But for Enda, who I’m sure is a decent man, it isn’t. Taoiseach at a time when it didn’t matter, his only real chance at a political legacy is to finally begin to address the innate inequalities that perpetuate Ireland’s status as a failed state. Maybe Dustin might start the process by sending him a download of “We All Stand Together”. The loudest sound in Ireland today is the echo of the empty words around the death of Johnny Corrie. Once again, the airwaves are full of the breast-beaters, filling their lungs on the oxygen of publicity while ignoring their own complicity. And we are all complicit in Johnny’s death. The very politicians who slashed the services that might have helped the dead Kilkenny man now elbow their way to the plinth at Leinster House – a stone’s throw from where Johhny died – to proclaim their dedication to the cause of homelessness. As long as it doesn’t cost anything of course, and only until the headlines run out. Elsewhere, the leaders of the Catholic church, whose legacy of institutionalised abuse causes hundreds, if not thousands, of traumatised Irish victims to seek solace in drugs and drink every day, has promised to act. But the reparations due to the adults that became of the children they raped and abused remain unpaid. At every turn, they refuse to cough up the cash they have hoarded, swindled from the Irish people from behind a facade of piety. And those of us who walk the streets of our cities have nothing to be proud of, either. How many of us have contemptuously called people like Johnny scobes and junkies and scumbags? How many of us have described them as a blight on our cities, an eyesore, a problem to be solved? How many of us went to the polls at the last election and voted for permanent austerity, ensuring that the first services to be cut would be the ones that might save the lives of people like Johnny? How many of us have pursed our lips and piously proclaimed “I won’t give them money, because they’ll only spend it on drink or drugs”? It may come as a shock to your middle-class sensibilities, but to an addict, drink and drugs are a very important part of their day; in fact you could say they are the most important part of it. Even more so, on occasion, than having a roof over their heads. Everything else comes second. And if you don’t give them money, they’ll get it somewhere else. What we have have created a society where the market decides who gets to have a home, and what kind of home it is. We have created a society that says everyone is equal, until they slip up. We have created a society that looks down patronisingly on those who live on the streets, without ever asking what it was that put them there, or offering them anything like a reasonable chance to turn things around. And even in Johnny’s terrible death, the class card is played. As if the families of other addicts don’t care. As if the deaths of working-class addicts don’t matter. As if addiction is selective. Then the Indo tells us that “despite the best efforts of his parents and services, he could not defeat his demons” – something you never see written about a drug addict from Fatima Mansions or Dolphin’s Barn. Sophie Pigot is rightly praised for not stepping over Johnny’s corpse and instead getting a policeman at Leinster House to call for an ambulance – but is this what we have come to? Have we fallen so far as a society that we must make a heroine of someone who does exactly what one is supposed to do when they see another human being in need? Johnny Corrie died in a Dublin doorway on December 1 2014, but he didn’t die alone. Every one of us played a part in creating the country in which he could die so publicly, so helplessly, so needlessly. We all stood over him as he passed on. And none of us did anything, and now it’s too late.